You have added Check It Out Black and Ivory Crossover Capsleeve A-Line Dress into shopping cart. 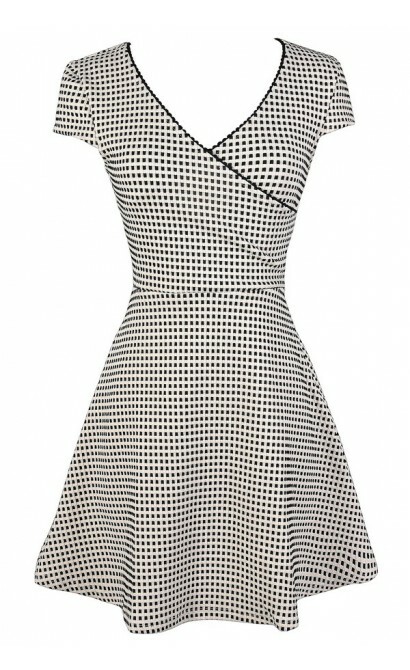 This adorable black and ivory checkered dress features a flattering cut and a subtle schoolgirl chic style. The Check It Out Black and Ivory Crossover Capsleeve A-Line Dress is made of a substantial fabric with a black and ivory geometric pattern throughout. It has a crossover V neckline, cap sleeves, and an A-line cut. A hidden side zipper completes this dress. The Check It Out Black and Ivory Crossover Capsleeve A-Line Dress would look perfect paired with black or ivory pumps, wedges, or mary janes. Try pairing this dress with black tights if you want more coverage. This is an adorably flattering style. Details: Hidden side zipper. 95% polyester, 5% spandex. Hand wash cold water separately. Color will bleed. No bleach. Hang to dry. Small measurements: Length from top of shoulder to hemline: 33". Bust: 32". 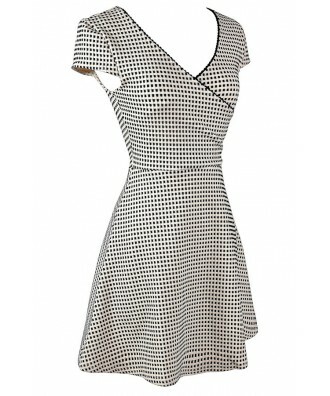 You have added Check It Out Black and Ivory Crossover Capsleeve A-Line Dress into Wishlist. You have added Check It Out Black and Ivory Crossover Capsleeve A-Line Dress for Stock Notification. You have set Check It Out Black and Ivory Crossover Capsleeve A-Line Dress as a loved product. 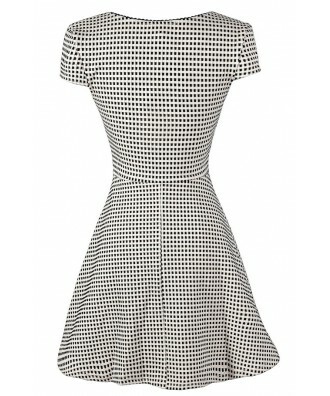 You have removed Check It Out Black and Ivory Crossover Capsleeve A-Line Dress as a loved product.